WIFI Key Generator is a simple tool that will help you to protect your wireless network so that nobody steals your connection. The comfort of wireless networks is unquestionable, but you always run the risk of somebody accessing your connection without your permission. For that reason, it is very important to configure your network properly and establish a secure password. To get a secure password you only have to follow a couple of steps. In the first place, you have to indicate if your wireless network has WEP or WPA/PSK encryption. 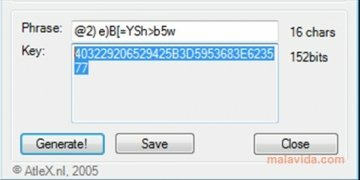 If it's a WEP network, you'll have to choose between a 64, 128, 152 o 256-bit key. After that, WIFI Key Generator will create a secure password. This is the password that you'll have to configure your wireless network with, so that nobody can access it. Since these passwords are difficult to remember, WIFI Key Generator allows you to save them in a text file. 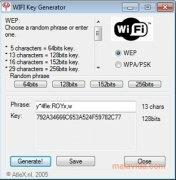 WIFI Key Generator will avoid your connection quality from being jeopardized because other people are taking advantage of it. This download requires a ZIP compatible compressor. Also requires that Microsoft .NET Framework 2.0 is installed.